Quarterback Deshaun Watson played an outstanding game of football against the Colts. Watson’s best throw of the day came on a vertical route where DeAndre Hopkins was able to separate from the coverage of Colts’ Pierre Desir, extending to collect the football after Watson was able to escape pressure, but Hopkins lost control when impacting the field. After Will Fuller was forced from the game due to injury, Watson was forced to find a second option in the passing game, and their fourth-round selection out of Texas Tech, Keke Coutee, answered the call. Easily setting career-highs across the board, Coutee became an integral part of the offense, and none more important than his reception on an out route while covered by Nate Hairston to extend the chains on third down of overtime. Texans edge defender JJ Watt was once again unstoppable against the Colts. Watt frequently won his matchup against Indianapolis right tackle Denzelle Good, as he made an impact in the running game and also recorded two strip sacks. Edge defender Jadeveon Clowney had a mixed outing for the Texans. Clowney did not have a huge impact rushing the passer; however, he made up for it with numerous disruptive plays in the running game. Furthermore, he was also called for four penalties, including three pre-snap penalties. Another game, another excellent showing from breakout rookie linebacker Darius Leonard. The South Carolina State product had previously collected 33 solo tackles, 16 run stops, two sacks and two pass defenses during his first three NFL games. Becoming a vital component within an extremely young defense, Leonard racked up double-digit tackles along with another sack during the overtime loss. While the box score will not properly highlight his impact on the field, defensive interior Margus Hunt disrupted the flow of the Texans’ offense throughout the contest. Hunt was able to collect his fourth sack of the season and combined with Denico Autry and Kemoko Turay to consistently move Watson from his spot. Indianapolis wide receivers struggled for the majority of the afternoon, as they dropped numerous passes of quarterback Andrew Luck. Furthermore, Colts pass-catchers did not really help their quarterback in contested situations, either. The Colts’ offensive line held up considerably well in pass protection as they allowed just two sacks on more than 60 Luck dropbacks, and there were multiple occasions when Luck had plenty of time to find an open receiver down the field thanks to the work of the offensive line. 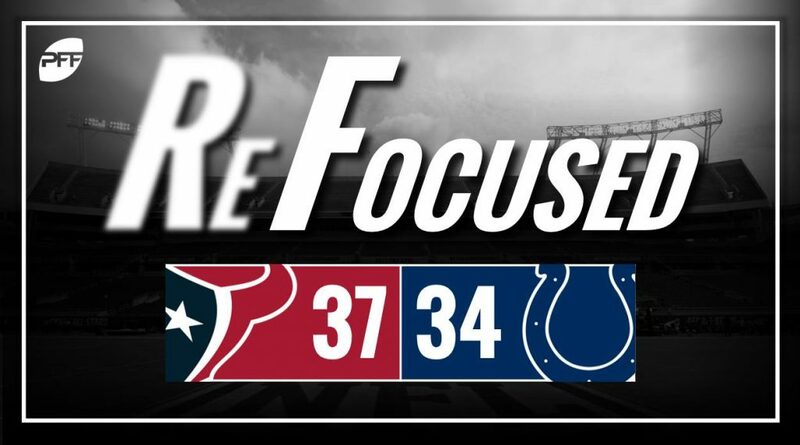 Watson was able to move the ball with excellent efficiency to collect the Texans’ first win of the season. His ability to use his legs to extend plays proved to be the catalyst for the victory. The Indianapolis receivers let Luck down with costly drops too many times, including one in overtime, which would have extended the Colts’ drive before they had to settle for a field goal.